The gap between SEO (Search Engine Optimization) and UX (User Experience) has significantly decreased in the past few years, with search engines making strides towards a user experience oriented web. Search engines have a philosophy of bringing relevant and good quality content to users, and their SERPs are beginning to really reflect that. But if search engines are heavily emphasizing providing users a good experience, why even worry about SEO? If I provide a good user experience, won’t search engines be able to figure it out? Although search engines are getting smarter, they don’t have the ability to process your site’s experience like people can. We need to give search engines some explicit clues to help them figure out what your site is about. This is where SEO and UX really begin to clash, forcing you to sacrifice one for the other. UX designers really focus on providing high quality content and a good user experience to users already on your site. In comparison, SEOs focus on helping search engines figure out what your site is about, figuring out how to rank higher to drive traffic towards your site, and providing a good experience for users coming from search engines. The most common example of how SEO and UX conflict is through consolidation of content. A UX designer may decide to provide users with a single page experience, addressing many different user intents all in one place. A single page experience may be ideal for users already on your site, but this is not the case for users coming from search engines. We need to segment our content on different pages to serve different user intents. People with different user intents will be searching with all sorts of queries. A visitor coming from a search engine doesn’t want to sift through your page looking for what they want. They already conducted a search through their search engine; they don’t want to have to do it again. They want their own personal user intent to be addressed as the center focus of the page. Another example of where SEO and UX conflict is the design your site’s navigation. UX designers often rely on the user’s intuition to figure out where certain sections are on the site. Search engines need a little more help navigating your site. They need explicit and structured way of navigating your site through drop down menus and internal links. Extra menus and links can be distracting to the user, but you need to sacrifice UX a little bit to improve your SEO. With search engines pushing for a user-experience oriented web, the gap between SEO and UX is beginning to really narrow. They are closely connected and you really can’t have one without the other. You have no chance of ranking well on search engines without a solid UX, and an awesome UX is pointless if there is nobody on the site to experience it. 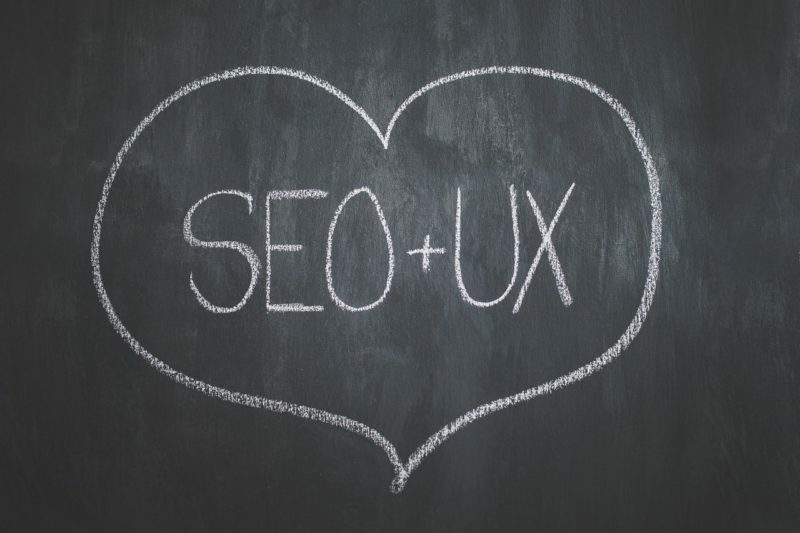 Here are a few ways in which SEO and UX really work together. Users are much more likely to share and link to pages that provide a good user experience. The resulting traffic and backlinks will improve your domain’s authority and will tell search engines that your website provides searchers with good quality content. Traffic, bounce rates, returning users and backlinks are things search engines can understand, and providing a good UX definitely improves all of these metrics. Insights and statistics we get from SEO practices such as keyword research helps you understand what your target market is looking for. By knowing what your target market is searching, you can provide more relevant content to visitors creating a better user experience overall. With search engine usage increasing more than 10% yearly, SEO is becoming more important than ever. The reality is that a significant portion of your traffic is going to come through search engines, and you need to cater your UX towards these users just as much as you cater to users already on your site. The truth is, your user’s experience starts even before they visit your site. It starts with their initial search query, and you need to carve an easy to follow path to the content they are looking for. Wanna know more about SEO? Looking to consult our team? Read about our professional SEO services and get in touch with us today!